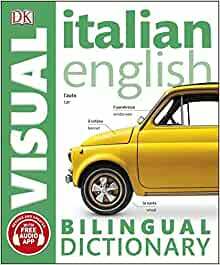 The Italian English Bilingual Visual Dictionary is your essential vocabulary guide to the world around you. With over 10,000 fully illustrated terms arranged by theme, language learning has never been easier. Perfect for tourist and business travellers alike, DK's Bilingual Visual Dictionary series is by your side when buying food, talking about work, discussing health, and studying language. 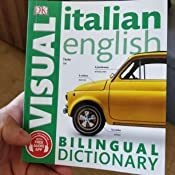 Stunning visuals and comprehensive indexes combine to make the Italian English Bilingual Visual Dictionary your indispensable Italian language companion. 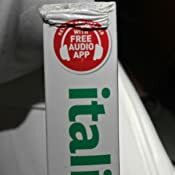 Fully updated to reflect recent changes in technology and clothing, the Italian English Bilingual Visual Dictionary also features an easy-to-use audio app, enabling you to hear terms spoken out loud in both Italian and English. Learn and retain all the key phrases you need to know, and perfect your pronunciation with audio help. 5.0 out of 5 starsAn invaluable aid for teachers and students. I find this book invaluable in teaching absolute EFL beginners . For example, for an Arabic speaker who is a pastry cook and bread maker, the pages on types of bread and cooking methods were immediately relevant, the unmistakable, detailed illustrations enabling him almost instantly to learn some of the vocabulary he desperately needs. Astonishingly high quality.. 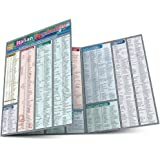 I would consider this fanatastic for an Italian beginner to intermediate student as I am. 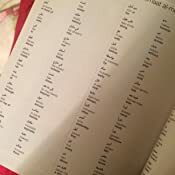 In class we were given 100 words to look up and it useful to have this dictionary to look up the words and pictures. In Italian there are very similar words or words which are the same but mean something different i.e. the word " nipote", means granddaugher, grandson, niece & nephew and the only distinction is the prefix of male (il) or female (la) and its handy to have the pictures just to wrap your head around these nuances of the italian language. Everyone learns differently, for me this helps the word stick in my mind and appreciate the nuances of the language. I will also be carrying it with me on holiday to Rome in May 2019 to help when going to the il supermercato & ristorante's and for general assistance when I get stuck. I genuinely like the idea of making an effort to learn/ speak the language of the country I visit and this dictionary has helped me immensely along with my classes. My only negative is that in some sections you have a vocabulary section and hints on asking one or two questions i.e in the restuarant ( how to ask for a table / menu/ bill) the time Che ore sono? what time is it? and how to answer the time ( sono le tre..... etc) - but it doesn't do this for all sections, which is a shame. But all in all a solid 4.5 stars - my classmate liked it so much she has also purchased one. 2.0 out of 5 starsIt is what it is. It is exacty what it says it is, and does what it says it does. Apparently some people learn better this way, but it's not for me (I'm making and learning vocab via AnkiDroid flashcards). It's not very useful as a dictionary - lots of apparently-common words are missing. 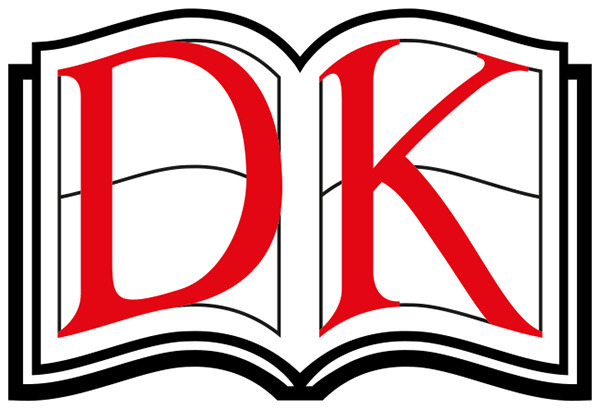 4.0 out of 5 starsGood, well presented DK concise reference to recap or pick up words. It's a fairly small footprint (~6x6") and about 1" thick, fairly unobtrusive really if you want to take it with you somewhere, It's quite densely packed containing a lot of information and is typically, for DK, well presented and laid out. Covers a very broad range from food, medicine, animals through to planets, concisely and usually through simple scenes or images with French/English labels so great if you like to associate words with the relevant image rather perhaps than just lists of text. Good to thumb through and quickly re-read various words to keep fresh. I'm learning Arabic and this book really does help improve my understanding and helps promote my vocabulary. Very pleased with the purchase. The book is very detailed. It covers almost every aspect of subject. The contents page is a bit less detailed, but thank goodness you have Arabic index and English index at the back so if you wanted to find the word in either language the index will help you locate it. Over the moon with the purchase!!! I am finding this a very useful book, in that it makes clear the various names of various bit of everyday objects. It is possible to be ultra critical and say that there are no exploded views, breaking them down into component parts, but for most people this book will give all the information needed. 5.0 out of 5 starsVery comprehensive book. This is an incredibly comprehensive book that covers just about anything you might need to know. It would be especially helpful for those who are thinking of living in a German speaking country as it covers hospitals/offices/shopping EVERYTHING!! I am teaching myself German for holidays and it is great for that too.